Auto Turned Products (ATP) specialises in manufacturing turned parts, presswork and assemblies for blue chip customers in the motor industry. It is a preferred supplier to Jaguar Land Rover and also numbers Rolls-Royce, Bentley and Aston Martin among its customers. 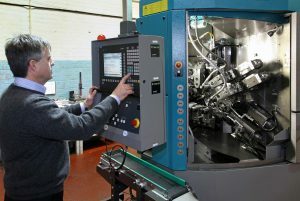 Operating from 55,000 sq ft premises in Round Spinney, near Northampton, the independently owned company celebrated its 50th anniversary in 2012 with the purchase of a 32 mm capacity INDEX MS32 six-spindle CNC automatic from Kingsbury. Originally, ATP produced its components on cam multis, later progressing to CNC fixed-head lathes and then CNC sliders. However, the company wanted to reduce production costs further by enabling each operator to look after more spindles. One person can look after as many as four INDEX multi’s once they are set up and running, despite their apparent complexity. In each machine, there is the production capacity of three to four CNC twin-opposed-spindle turning centres in a compact footprint. So an operator can preside over production output equivalent to that of 12 to 16 lathes. It would require four operators to run that number of sliders or fixed-head bar autos, added to which the machines would occupy much more space on the shop floor and consume more power. Reduced labour cost is one driver for investing in a CNC multi, but there is another compelling reason. Tool life is dramatically prolonged, in some cases by more than 10 times, resulting in further big financial savings. The harder and tougher the material being machined, the greater the benefit. Apart from the cost savings resulting from buying fewer cutters, two related benefits increase the bottom line further. First, longer tip life on the INDEX multi means fewer tool changes, reducing downtime. Second, bar wastage is lower, as a 10-fold increase in tool life cuts the chance of producing scrap by an order of magnitude. Moreover, uptime on the CNC multi is high, as it runs for well over 90 per cent of available time, maximising profitability. Vic Pais, CNC Production Engineer.